Last night friends invited me over for dinner. As we ate Lake Erie perch, we talked about food – where holiday meals would be eaten, travel plans, restaurant favorites, and New Year’s meals and itineraries. Food and food memory are key to everybody’s holiday traditions and powerful seasonal associations come from foods around the holidays. Jean Harbison Journey, my mother, would be the first to tell you that she never cared to be known for her cooking. As a young woman getting married and starting a family in the ‘50s, she – like most women of her generation – was looking for convenience and ways to juggle feeding a family with her busy schedule of work, volunteering, and other activities. She was heavily engaged in P.T.A., church, and community. Even so, she got meals on the table and there were always favorite meals and special treats that she made. None of her dishes, however, got and gets as much attention as her fresh apple cake. There are many fresh apple cakes out there but Mother’s has to be among the finest I’ve ever tasted – okay, it’s by far the best. She gets just the right combination of firmness and moisture and once somebody has sampled Mother’s cake, they always want more. The process is a collaboration between Mother and Dad with him chopping the apples and stirring the mixture to Mother’s satisfaction. In years past, I would come to town for Christmas only to find my parents busy in the kitchen with almost a factory line in motion of putting together and baking cakes for the family meals and as Christmas presents for friends. The whole house smells like Christmas on these occasions. Sometimes I would chauffeur as Mother delivered cakes on Christmas Eve. Oftentimes, people brazenly asked Mother to bring one of her fresh apple cakes. This applied even to doctors’ offices. Mother would have an appointment scheduled and would get a call from the office asking if she might be bringing an apple cake along. She always tried to comply. Mother and Dad have slowed down and aren’t able to make the volume of fresh apple cakes they used to make but the cake still makes appearances on holidays, birthdays, and special occasions. She occasionally still takes one to the offices of favorite doctors and their staffs when she feels like it. I have tried to make Mother’s recipe exactly once. The right flavor was there but the texture and form were a mess and I haven’t dared try again, although Mother gave me several pointers about what I might do differently next time. I gather that I should spray my cake pan with Baker’s Joy baking spray and have noted that on my copy of the recipe (if I ever get the courage to try it again). I also suspect that I overworked the batter and should have let it rest longer. I gave the recipe to a friend years ago and she said it took her four tries to get it tasting like Mother’s. When my brother anchored a television news program, Mother was invited on to demonstrate how to make her fresh apple cake. She performed like someone who had been in front of the camera all her life and was told later that it was one of the most requested recipes at the station. It is a perfect cake for dessert at any meal and is always a favorite for breakfast. Mother is a teetotaler and I would never dare do it, but I suspect that this would be a great cake to drizzle with a bourbon-based sauce. As Christmas quickly approaches, I’m sharing Mother’s recipe with my highest recommendation. I’ll tell you up front that even if you follow the recipe to the letter, I doubt that it will match hers. But it will still be delicious and memorable. Add oil, eggs, and vanilla. Mix well. If dough is stiff, let it stand for a while and mix again. Pour mixture into a tube pan. Bake in a pre-heated oven at 350 degrees for 50-60 minutes. 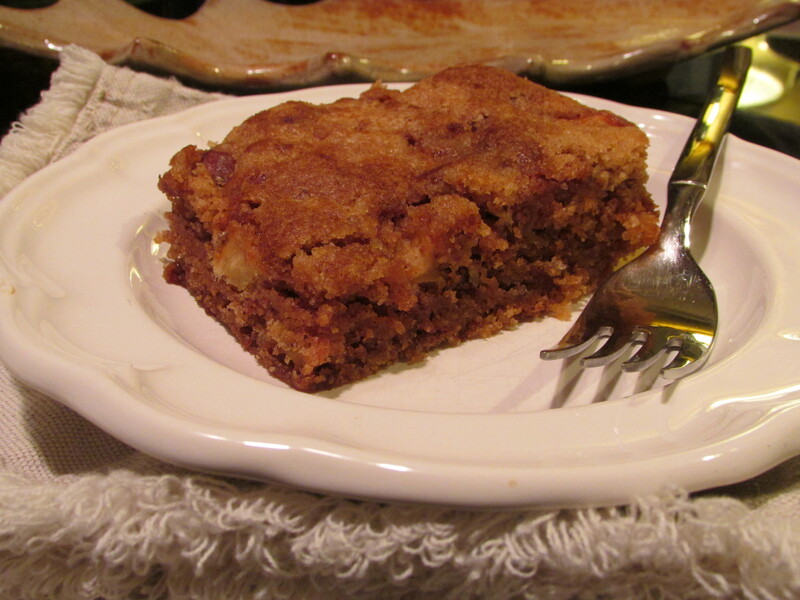 This entry was posted in Christmas, food, fresh apple cake, Jean H. Journey and tagged food, fresh apple cake, recipes on December 7, 2014 by gedwardjourney.